Because It's Fun and Healthy! Our Drum Instructors offer lessons in drums and percussion for students of all ages and levels. We welcome students who are just getting started on the drums and those with advanced drum playing skills. For young children, we generally recommend group classes, before moving on to private lessons. 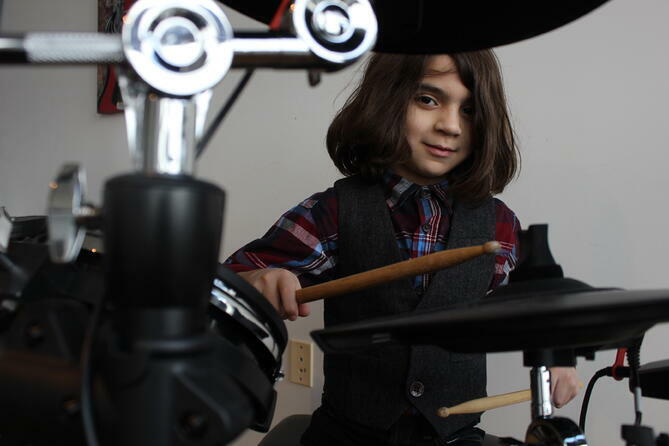 Private Drum Lessons are available in 30-minute, 45-minute, and 60-minute slots. Schedule your first Drum Lesson today! Drum Students taking private lessons should own, or have easy access to, a drum set for regular practice. If you can play the drums, you will have opportunities to join a local band. And best of all, we can also prepare you for that experience and teach you how to succeed in a band setting. Once you have a year or so of Drum Lessons under your belt, join our ROCK+ program! Here, you'll learn in weekly rehearsals how to play with other musical instruments (esp. guitars, basses, and singers) in a rock band, and even write your own songs! Aside from the musical joy of drumming, drum lessons also offer some other important benefits you may not have thought of before! 12. Drumming provides a medium for individual self-realization." Schedule Your First Drum Lesson!